The circulatory system is effectively a network of cylindrical vessels: the arteries, veins, and capillaries that emanate from a pump, the heart. In all vertebrate organisms, as well as some invertebrates, this is a closed-loop system, in which the blood is not free in a cavity. In a closed circulatory system, blood is contained inside blood vessels and circulates unidirectionally from the heart around the systemic circulatory route, then returns to the heart again, as illustrated in Figure 1a. 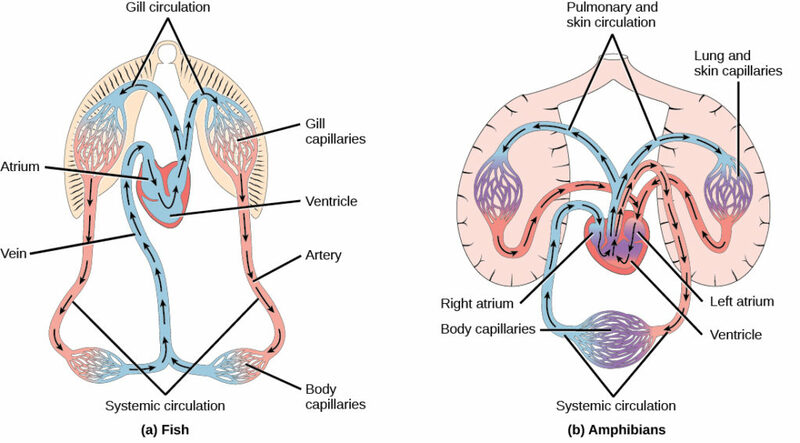 As opposed to a closed system, arthropods—including insects, crustaceans, and most mollusks—have an open circulatory system, as illustrated in Figure 1b. In an open circulatory system, the blood is not enclosed in the blood vessels but is pumped into a cavity called a hemocoel and is called hemolymph because the blood mixes with the interstitial fluid. As the heart beats and the animal moves, the hemolymph circulates around the organs within the body cavity and then reenters the hearts through openings called ostia. This movement allows for gas and nutrient exchange. An open circulatory system does not use as much energy as a closed system to operate or to maintain; however, there is a trade-off with the amount of blood that can be moved to metabolically active organs and tissues that require high levels of oxygen. In fact, one reason that insects with wing spans of up to two feet wide (70 cm) are not around today is probably because they were outcompeted by the arrival of birds 150 million years ago. Birds, having a closed circulatory system, are thought to have moved more agilely, allowing them to get food faster and possibly to prey on the insects. Figure 1. In (a) closed circulatory systems, the heart pumps blood through vessels that are separate from the interstitial fluid of the body. Most vertebrates and some invertebrates, like this annelid earthworm, have a closed circulatory system. In (b) open circulatory systems, a fluid called hemolymph is pumped through a blood vessel that empties into the body cavity. Hemolymph returns to the blood vessel through openings called ostia. Arthropods like this bee and most mollusks have open circulatory systems. The circulatory system varies from simple systems in invertebrates to more complex systems in vertebrates. The simplest animals, such as the sponges (Porifera) and rotifers (Rotifera), do not need a circulatory system because diffusion allows adequate exchange of water, nutrients, and waste, as well as dissolved gases, as shown in Figure 2a. 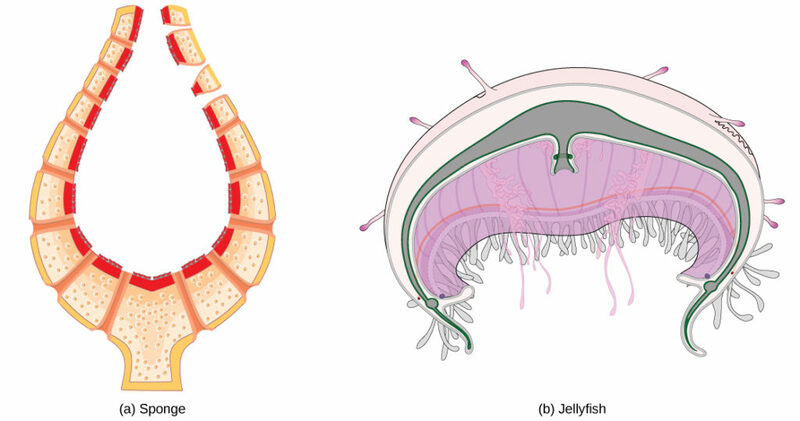 Organisms that are more complex but still only have two layers of cells in their body plan, such as jellies (Cnidaria) and comb jellies (Ctenophora) also use diffusion through their epidermis and internally through the gastrovascular compartment. Both their internal and external tissues are bathed in an aqueous environment and exchange fluids by diffusion on both sides, as illustrated in Figure 2b. Exchange of fluids is assisted by the pulsing of the jellyfish body. Figure 2. Simple animals consisting of a single cell layer such as the (a) sponge or only a few cell layers such as the (b) jellyfish do not have a circulatory system. Instead, gases, nutrients, and wastes are exchanged by diffusion. For more complex organisms, diffusion is not efficient for cycling gases, nutrients, and waste effectively through the body; therefore, more complex circulatory systems evolved. Most arthropods and many mollusks have open circulatory systems. In an open system, an elongated beating heart pushes the hemolymph through the body and muscle contractions help to move fluids. The larger more complex crustaceans, including lobsters, have developed arterial-like vessels to push blood through their bodies, and the most active mollusks, such as squids, have evolved a closed circulatory system and are able to move rapidly to catch prey. Closed circulatory systems are a characteristic of vertebrates; however, there are significant differences in the structure of the heart and the circulation of blood between the different vertebrate groups due to adaptation during evolution and associated differences in anatomy. Figure 3 illustrates the basic circulatory systems of some vertebrates: fish, amphibians, reptiles, and mammals. As illustrated in Figure 3a Fish have a single circuit for blood flow and a two-chambered heart that has only a single atrium and a single ventricle. The atrium collects blood that has returned from the body and the ventricle pumps the blood to the gills where gas exchange occurs and the blood is re-oxygenated; this is called gill circulation. The blood then continues through the rest of the body before arriving back at the atrium; this is called systemic circulation. This unidirectional flow of blood produces a gradient of oxygenated to deoxygenated blood around the fish’s systemic circuit. The result is a limit in the amount of oxygen that can reach some of the organs and tissues of the body, reducing the overall metabolic capacity of fish. As shown in Figure 3b, amphibians have a three-chambered heart that has two atria and one ventricle rather than the two-chambered heart of fish. The two atria (superior heart chambers) receive blood from the two different circuits (the lungs and the systems), and then there is some mixing of the blood in the heart’s ventricle (inferior heart chamber), which reduces the efficiency of oxygenation. The advantage to this arrangement is that high pressure in the vessels pushes blood to the lungs and body. The mixing is mitigated by a ridge within the ventricle that diverts oxygen-rich blood through the systemic circulatory system and deoxygenated blood to the pulmocutaneous circuit. For this reason, amphibians are often described as having double circulation. Figure 3. (a) Fish have the simplest circulatory systems of the vertebrates: blood flows unidirectionally from the two-chambered heart through the gills and then the rest of the body. (b) Amphibians have two circulatory routes: one for oxygenation of the blood through the lungs and skin, and the other to take oxygen to the rest of the body. The blood is pumped from a three-chambered heart with two atria and a single ventricle. Most reptiles also have a three-chambered heart similar to the amphibian heart that directs blood to the pulmonary and systemic circuits, as shown in Figure 4a. The ventricle is divided more effectively by a partial septum, which results in less mixing of oxygenated and deoxygenated blood. Some reptiles (alligators and crocodiles) are the most primitive animals to exhibit a four-chambered heart. Crocodilians have a unique circulatory mechanism where the heart shunts blood from the lungs toward the stomach and other organs during long periods of submergence, for instance, while the animal waits for prey or stays underwater waiting for prey to rot. One adaptation includes two main arteries that leave the same part of the heart: one takes blood to the lungs and the other provides an alternate route to the stomach and other parts of the body. Two other adaptations include a hole in the heart between the two ventricles, called the foramen of Panizza, which allows blood to move from one side of the heart to the other, and specialized connective tissue that slows the blood flow to the lungs. Together these adaptations have made crocodiles and alligators one of the most evolutionarily successful animal groups on earth. In mammals and birds, the heart is also divided into four chambers: two atria and two ventricles, as illustrated in Figure 4b. The oxygenated blood is separated from the deoxygenated blood, which improves the efficiency of double circulation and is probably required for the warm-blooded lifestyle of mammals and birds. The four-chambered heart of birds and mammals evolved independently from a three-chambered heart. The independent evolution of the same or a similar biological trait is referred to as convergent evolution. Figure 4. 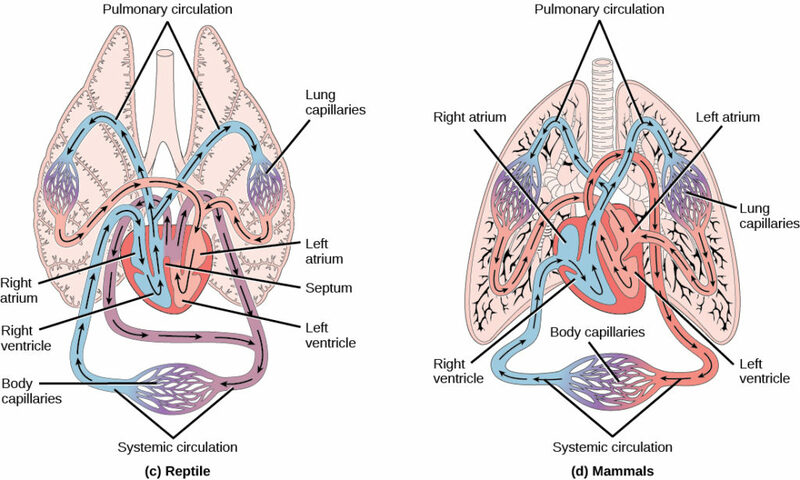 (a) Reptiles also have two circulatory routes; however, blood is only oxygenated through the lungs. The heart is three chambered, but the ventricles are partially separated so some mixing of oxygenated and deoxygenated blood occurs except in crocodilians and birds. (b) Mammals and birds have the most efficient heart with four chambers that completely separate the oxygenated and deoxygenated blood; it pumps only oxygenated blood through the body and deoxygenated blood to the lungs.